I love bike prints, and we have always found them to be very popular at Treadle. It's not surprising, since the Twin Cities area is consistently ranked as a great place to bike, plus the vintage charm of a bike print speaks for itself, whether or not you're fond of cycling. The colors of these bike prints and their coordinates are saturated, set off by creamy off-white. They're printed on heavier weight cotton, making them ideal for projects like pillows, cushions, purses, or bags. A heavy, flared skirt or structured jacket (think denim-styling) would also be ideal. I love the quiet palette of greeny-grays and subtle reds in this group of fabrics. I don't think any of them are actual reproductions, but they echo the style and feeling of old 19th century prints. A few in this group are from Moda, and others, like the keys, are Riley Blake. 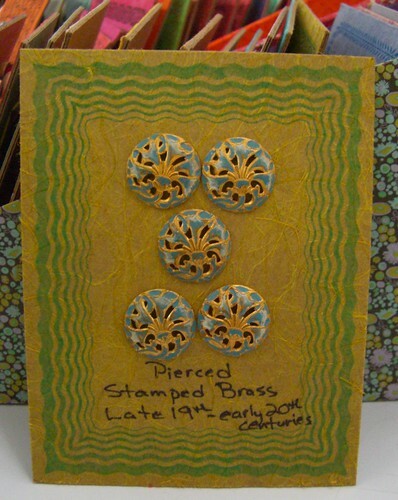 These would be great in a quilt with a Civil War style pattern, or a crisp shirtdress with a vintage feel. 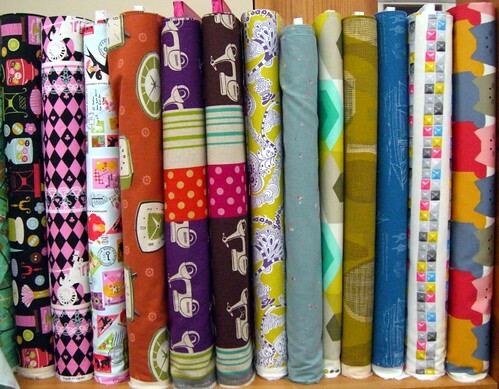 These paper doll fabrics are just too adorable to resist! The panel can actually be cut apart and made into "paper" dolls. 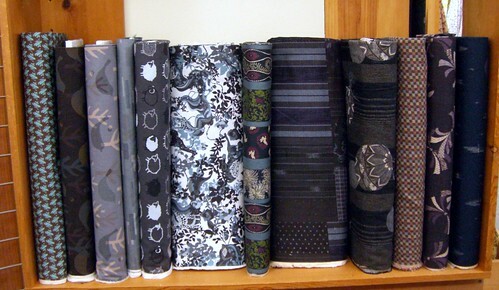 Treadlette Rebecca reports success with fusing the images to heavy Peltex interfacing, then cutting. The coordinating outfits, below, come in two colorways. A quilt would be another charming way to use these. The animal print that coordinates with these would be the perfect backing fabric. At Treadle this summer, we've been fortunate to have a terrific selection of printed cotton voile and lawn, and many coordinating solids as well. A few more arrived recently to add even more color and variety. The line is London Calling from Robert Kaufman. The prints are bright and fresh, and the smooth, fine hand of this lightweight cotton makes it ideal for simple summer sewing. Because it's lightweight, ruffles and gathers will flatter instead of adding bulk. The eye-catching prints allow you to keep the design simple and let the fabrics speak. Come in and check these out, as well as the dozens of other printed lawns we have in stock. Check out these new trims we just got in! They are knitted fold-over trim. The bright group (above) is 100% cotton, and the heathered and muted shades (below) are 100% wool. A fold-over trim is meant for binding raw edges on a garment edge; the most common fold-over trim is bias tape. It's simple to use, just fold the trim along the center crease, then sandwich the fabric inside the fold and sew. If your fabric is slippery, you can sew one side first, then fold around and sew the remaining side. The best part is that since they are knitted, they have plenty of stretch for applying to knit garments. At Treadle, our large selection of unique buttons has made us a destination for knitters and sewists alike. 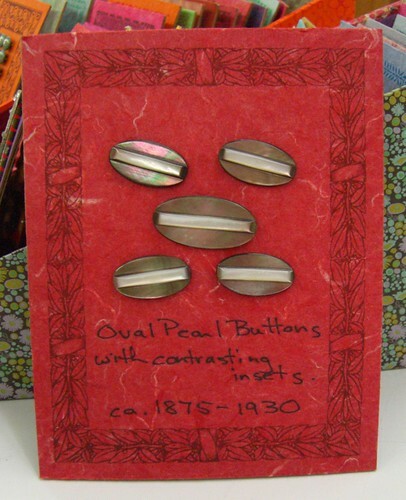 But did you know Treadle also carries a selection of vintage buttons? These amazing, one-of-a-kind buttons are supplied to us by a local woman, an avid button collector, whose beautiful sorting and presentation are almost as delightful as the buttons themselves. Here are a few of my current favorites. Each set is displayed on a brightly colored card with printed borders, and the date, material, and any historical information are neatly written beneath. Our selection includes glass, ceramic, Bakelite, steel, enamel, mother-of-pearl, and many other materials. With buttons this unique, it’s easy for the button to become the starting point to design the garment. 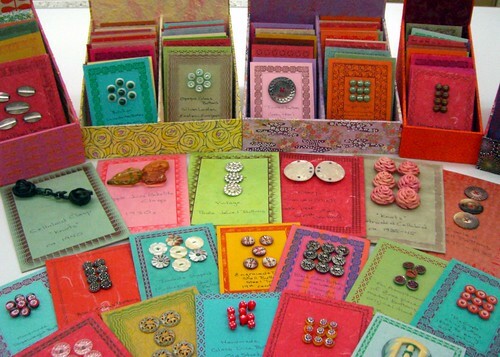 Many people have also told us they have simply left the buttons on their cards and framed them as wall art. The selection is refreshed regularly, so there is always something different! 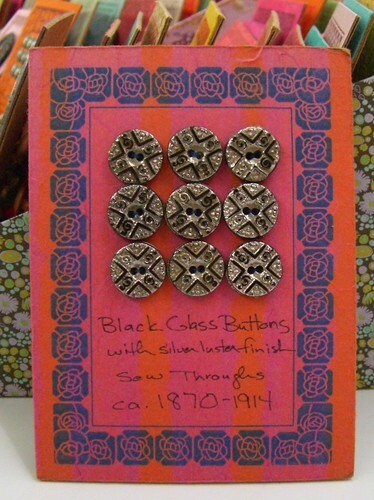 You probably haven't have seen these buttons on display at Treadle – that’s because we keep them under the counter. Any time you’d like to browse, just ask! We’ll be happy to bring them out for you. These pretty ribbons arrived recently. 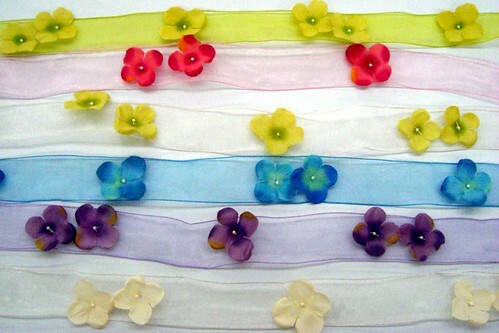 Available in several colors, they're sheer organza ribbon with big, monochromatic flowers scattered over the length. Each flower is accented with a tiny pearl bead. 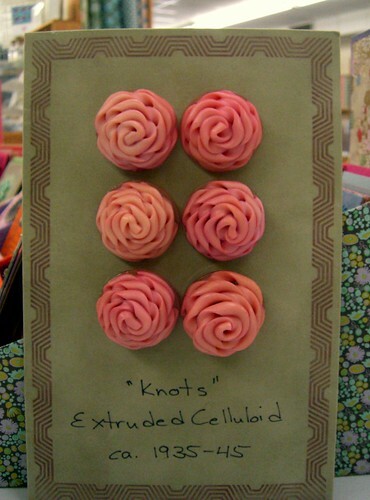 The wired edge makes them ideal for crafts, as they can be formed into bows and loops that will hold their shape. 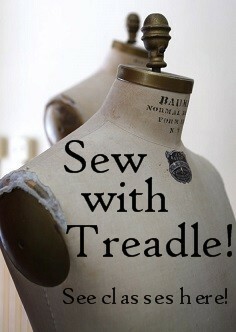 Or simply pull the wire out for a softer look on garments. These would make a sweet hem trim on a little girl's dress, or make a summery belt or hat band. This collection of prints at first seems like a departure from Amy Butler's usual psychedelic, color-punch style. But it's not a new direction, rather a look back, as she's re-released her first collection, Gypsy Caravan. The palette is subdued by contrast, but still has plenty of color for combinations that can pop or blend, depending on how you use them. 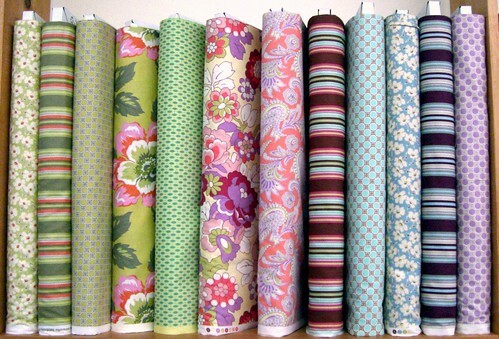 These fabrics would be great in a modern quilt or simple summer garments like crisp skirts and dresses. Recently we've added several new items to our Japanese import section. These prints are always beautiful, fun, and quirky, and most of them are printed on a heavier weight, slightly textured cotton fabric that more closely resembles linen. This colorful group includes images of scooters, sewing notions, vintage clocks, kitties, and geometrics, perfect for a cute handbag, tablet case, or decorator project. We also have a large group in subtler shades, making them more suited for garments. This weight would be great as an A-line skirt or simple jacket.